maklum…yg masak bul2 😀 First try..never seen a sosis solo before! Looks so yummy, Chef! Hehehe. I’m from Solo, so I guess I know a little bit about the history of this Sosis Solo. Once upon a time, Dutch invaded Indonesia and occupied Solo. The Dutch people loved to eat sausage with tomato or chili sauce. The sausage wrappings were made from pig intestines. It tasted too fatty for Solonese tongue and unconsumable for Solonese muslims. But, they were always drooling when watching the Dutch eating sausages. So, they decided to create Solo style sausage which is safe and will please their Solonese taste buds. And tadaaa, the now known as Sosis Solo was invented. 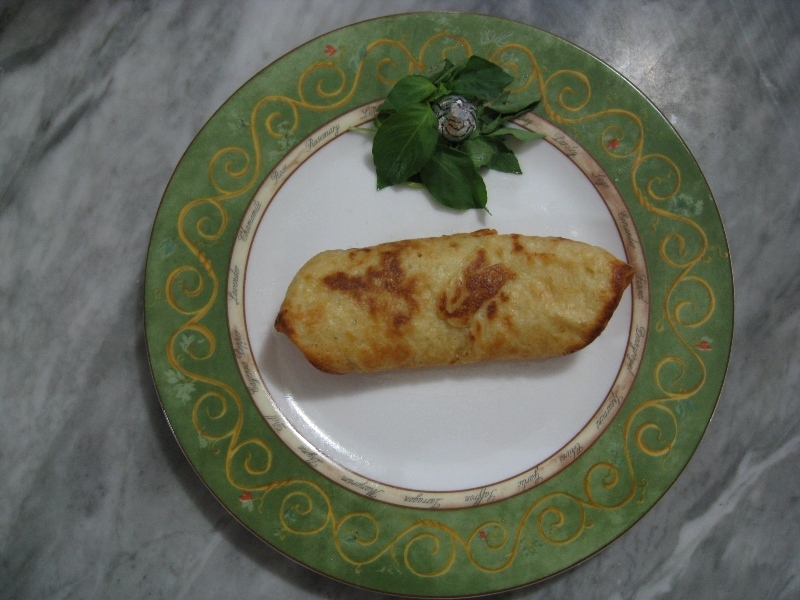 Minced meat/chicken wrapped with egg. There are another Dutch/western-inspired cuisine that you should try to make. Bistik Solo, for example, it’s inspired by beef steak. Hehehe. Thank you, i did try my best! Lol..i’m still learning after all…and i promise to improve! That’s an interesting Solo history…yeah i understand that sausage is usually Pork! I just discovered that the other day when I went to the US and was about to buy a sausage mcmuffin..thinking that because i can’t buy the bacon n egg mcmuffin..i’d go with the sausage mcmuffin. Good thing i found out it was pork! Cheers to the solo people for coming up with a solution to satisfy their drooling taste buds for a “sausage meal”…now we can enjoy it too! one question jen: dapet inspirasi dr mana utk bikin sosis solo? hahaha… bagus bagus jen, lanjutkan! Hehehe…hmmm well like Julie..i dedcided to follow a cookbook…and the cookbook i’m following is called: Camilan Indo hehehehe..so i’m gonna try all the camilan out there ;p i’m really excited…i can’t wait till i try the lemper part! tee hee…glad you liked it! It was one of ur favs…sosis solo…of course my cooking is dedicated to you…! silly boo boo….love ya! Mix the tepung terigu with the santan first…Because mixing with the egg is what causes it to berbutir…. it’s too much tepung terigu…so maybe its best to lower the dosage a bit…. Oh and to use a whisk…because I think whisking it makes the mix…blend better together. I’ll be sure to get a whisk..before my next attempt to cook again…which is today!!!! !